Steve Collins provides a look into the mentality and drills he uses on a day-to-day basis to build championship-caliber teams. These creative, full-court drills are aimed at developing a team and its players to play at a quick tempo while developing decision-making skills, ball-handling, court awareness, and shooting. Sequential drills are presented that are designed to give the offense a momentary advantage (in terms of the number of players) and force the offense to act quickly before the advantage is lost. A good transition game will get you easy baskets, it will distribute the ball so multiple players will get shots, it forces your players to work hard and push the ball, and it's easy to learn for your players. Use these drills to teach your players to play at a quick pace while maintaining poise. Several variations of the commonly used 3 Man Weave Drill are demonstrated. Each variation uses a different wrinkle that will force your team to communicate, sprint, shoot while under control, and pass with accuracy. 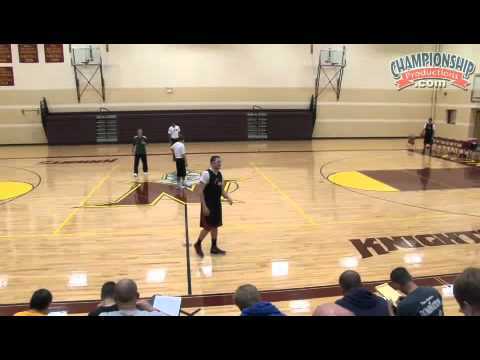 Several competitive drills are shown that briefly provide an extra player to the offense in an attempt to get a quick, high percentage shot before the defense can recover. Coach Collins then moves onto individual skill development drills while staying within a transition-based offensive mindset. Players are put through several full court drills that emphasize shooting, playing "fast and slow" based upon the shot type, and ball handling. Each drill is run in a full court setting to emphasize end-to-end sprints that simulate getting out on the break. The segment ends with a brutal, sequential conditioning drill that incorporates ball handling and skill development to increase stamina while executing a basketball-related exercise. This video combines the quick-paced drills and practice pace necessary to run an efficient and effective transition offense. This fresh approach keeps player interest level high and allows them to "play basketball" while not focusing on the negative connotation that surrounds conditioning. Coaches at every level will learn to develop the skills their players need to get easy transition points.